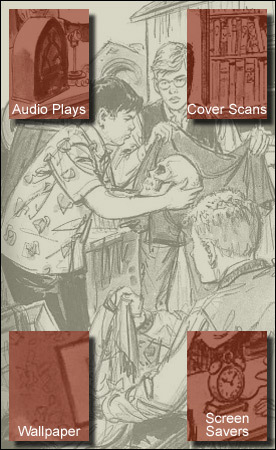 Improve your Windows experience with these Three Investigators screen savers. Doorfour contains five randomly dissolving illustrated scenes from the hardcover books. Greengateone is larger and contains scans of all 43 hardcovers and will run several minutes without repeating. To install, download the .exe file, locate it on your harddrive and double-click it to run the installation program. Please email me if you have any problems. Both screen savers require your color depth/palette to be set at a minimum of 16bit, with 24bit or higher giving the best results.